Simply Amazing. Totally worth a 2nd look. 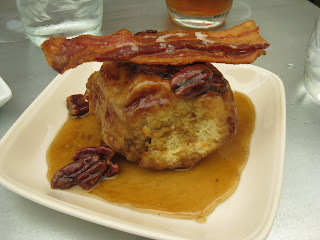 We started with a Pecan Sticky Bun done "Suzanne Style" which meant complete with Bacon toppings. Yummy! Great combination of sweet & savory. 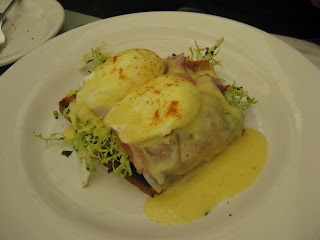 Then moved on to the The tavern “benedict” with prosciutto and lemon. I didn't actually try this one, but it looked beautiful. 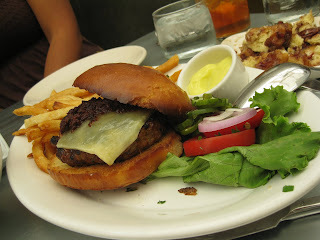 Then M and I split the pork, pork, pork with manchego and romesco burger, mostly because we wanted to try the herb fries w/ a nice garlic aoli which turned out to be the right choice. The fries were perfectly crisp and well flavored, very reminiscent of the fries at Beppe back in NYC.